It was an honour to have Mr. Srinivasan Desikan with us for a discussion on the software testing industry on 27 Oct. 2012. In a session that lasted 90 minutes, we covered topics ranging from theoretical underpinnings of concepts to practical problems in workplace. His knowledge, coupled with 23 years of testing and managerial experience was a perfect blend for the freshers standing at the doors of corporate world. Mr. Desikan is master technologist and senior architect at HP, Enterprise Servers and Storage in Bangalore. He has previously worked as the director of Quality Assurance and Testing at Talisma, Siebel and Agile software. He has contributed to several technical and management positions at Novell Inc., Wipro Infotech, and C-DOT and was part of large testing and product development teams. He is also the co-author of the book “Software Testing: Principles and Practices”, text book for our software testing module. Mr. Desikan holds a couple of patents in software testing, and presented papers on international conferences such as QAI India, ASIASTAR-2002 (Melbourne), PSQT/PSTT-2003 (Washington), SPIN (Chennai), STeP-IN (Bangalore) and ASIAPAC TC- 2010 (Singapore). A postgraduate in computer applications from Pondicherry Engineering College, he is currently an adjunct professor at several engineering colleges/universities/institutes to promote Software Testing as a subject. He has received numerous awards, the most recent being “Test.2008.in Thought Leadership Award” for his contribution to academia and industry. During the talk he frequently remarked ‘there is no wrong or right’ just to get that idea sink into us. Naturally, we were encouraged to participate in the discussion and within no time Mr. Desikan was answering an array of questions from the audience. The questions ranged from theoretical aspects of software testing, practical impediments and ways to tackle them to some general questions on why and how software testing can be an exciting field. He explained to us in detail why testing domain is perceived to be inferior to product development and how this perception is changing. He made a very valid point saying that while a developer must be a master in programming languages, a tester has to be a master in both programming languages and testing skills. A software tester has to understand the client requirement, understand the programme structure well and understand ways it can go wrong to develop test cases. A tester therefore plays a key role in quality management and end-product being fool-proof. Sharing some of his life experiences, Mr. Desikan inspired us with the life of struggle he had before success followed him. As a youngster who ventured into a recently introduced B.Sc. course in Computer Science, his hardwork and perseverance lead him towards a blossoming career. 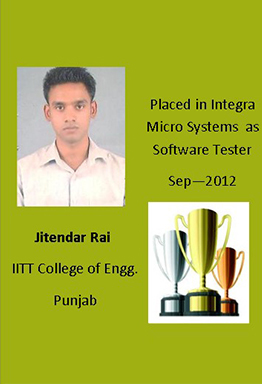 We owe him a lot for making us understand the hidden value of software testing as an exciting career path.